The Destination Vitale is immersed in the heart of the countryside and ideally located in the center of the island between sea and mountain for a better visit of the island without too much rolling a day. Located at the entrance of the road of the mamelles which takes you in less than half an hour on the most beautiful beaches of the coast under the wind and the center of diving Coustaud in Malendure. The bungalow is close to all conveniences: well stocked grocery store and medical center at Five minutes by car. Ten minutes by car you will have the commercial center of Collin. The bungalow has all amenities, VDSL2 internet connection (RJ45 or WIFI disabled), flat screen TV can switch from the room to the terrace with satellite channels, a bed of 160x200, air-conditioned, linen is provided, wc with shower, washing machine, wardrobe and plenty of storage, a small office. The kitchenette is fully equipped, oven, induction hob, dishwasher, toaster, microwave, coffee maker and Nespresso machine, crockery and cutlery. 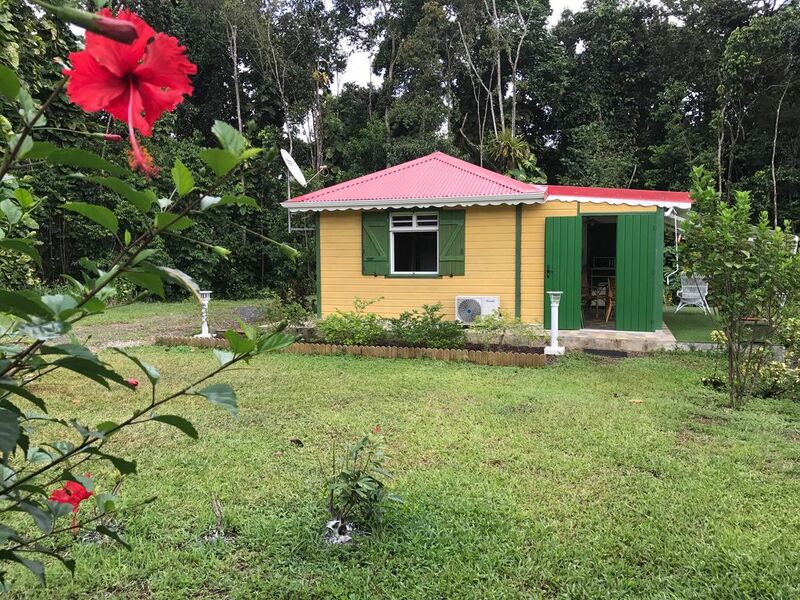 Electric gate, private parking, you will be truly quiet in the rainforest with possibility of access to the river crossing the forest (being well equipped). Les propriétaires sont très respectueux de notre tranquillité. Bungalow bien situé pour le départ de toutes balades et bien équipé. Il manque peut-être juste un aspirateur pour le ménage de fin de séjour. I stayed 11 days in this cottage which has all the comforts you need. The owner, Fabrice, and his mother are very friendly and helpfull and speak good English (they want to practice). The place is perfectly situated both for the mountains and for the big roads. Nous avons passé 15 jours dans ce bungalow , agréable et bien équipé. Vous êtes vraiment au calme (à la lisière de forêt). Les propriétaires sont à votre écoute et très réactifs. Bien situé pour visiter la Guadeloupe.